I’m finally working on a new project this week, and I’m starting to steer towards my old creative groove again. I sat down over the weekend to catch up on my YouTube subscriptions and finally finish up the threads on the collar I’ve been working on. Apart from a little custom work, I hadn’t made any progress at all for most of February. Once I got that out of the way, I picked out some beads for a nice, easy mini collar. I decided to splurge a bit and use some white-hearts to really keep the inspiration going. I like how the project is looking so far. The turquoise collar isn’t quite finished. If I want to make it wearable I’ll need to add some straps, but for now it’s just going to reside in my UfO pile. It might make it into an Ugly necklace, or maybe I’ll finish it and wear it someday. The good news is that I learned everything I needed for the project, so I’ll be able to work up a tutorial for it – as soon as I’m ready to take on such a lengthy project again. I haven’t yet been able to shake my very serious case of beader’s block, so I’ve been searching for ways to spark some new inspirations. I started by looking through my bead stash and taking out some tried and true favorites, to see if they could draw out some creativity. Of course I went directly to my collection of trade beads, and took out my lovely African Christmas beads. No matter what, just looking at these beads always lifts my mood. The chaotic combination of colors and the organic shapes are so essentially beady, and I’m always reminded just how much I love working with this medium. The stripes don’t hurt, either. My next pick is one of my current favorite finishes in Japanese seed beads. I’ve really been missing working with TOHOs lately. Although Czech seed beads offer a great value so I don’t have to worry about quantity, I really love the hefty shape of Japanese seed beads, and the exotic color combinations. I might have to think of a great project just for these black-lined blue beads and see if that can steer me back to my beading groove. Finally, my favorite thing in my stash right now is Fireline. I usually wait to purchase new beads until I’m running out of Fireline, then fill out my order with whatever beads catch my fancy. My budget hasn't been big enough for that in a while, but I was lucky enough to snag a roll each of Smoke and Crystal with a gift card recently, so I know I won’t run out of thread any time soon. I just have to find the right beads in my stash to get things rolling again. 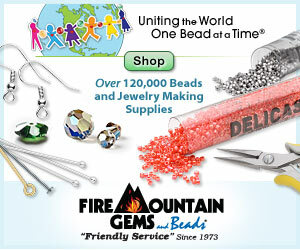 What kinds of beads are you most inspired by right now? Just before my creative spark got doused and I had to take a little bead break, I put together some new seed bead and accent trios. I wanted to play a bit with some of the red seed beads in my stash that have for some reason completely stalled. I picked up several different red hanks awhile back because I felt that my selection was lacking. For some reason, now that I have them, I never seem to need them. So I paired up two hanks of red and went looking for accents that would work well with an all-red palette. Since its Valentine’s Day, it seems like the perfect time to finally unveil these trios! I went with a high contrast combination right away, and paired the transparent cherry and ruby AB seed beads with lovely satin blue bugles. I love the way the light shines through all three of the beads. The cherry and blue go really well together, making just the right amount of room for the moodier ruby to fit in as a backdrop without clashing. I think this palette would be great in something long and fringy. I wanted to keep the momentum going with more light and a nice transparent pop of color, so I tried out yellow white-hearts next. I was hoping to get a sort of fiery look by combining the reds with yellow, and it worked out pretty well. I think the ruby would look even better in this trio with the addition of some black to smooth everything out. This palette would make a great collar or perhaps a chunky bracelet. Finally, I went with a nice easy neutral. I have to admit that the reds did have me thinking of Valentines, but instead of adding a stark white, I went with natural bone. I love the way the reds make the bone beads look creamy and elegant. Likewise, the natural color of the bone spacers keeps the reds looking organic and blend-able. I’d love to use this trio for a cuff bracelet or a statement pendant. What are you favorite ways to use red in beadwork? It’s kind of amazing what you can recreate with just a little fringe in the right colors. The idea for this super-easy cherry fringe design popped into my head when I was creating earring projects for Ancient Worlds Modern Beads, and it was just too fun not to make. These cherry bomb earrings look great in opaque or transparent colors, but I do recommend going with a bright green to avoid any resemblance to holly berries. On the other hand, you could modify the design a bit to get a cute holiday earring as well! 1. Attach a stop bead to 1 yard of stretched and conditioned thread, leaving a 6 inch (15 cm) tail. Pick up 1 8/o seed bead, 1 spacer, 1 8-10mm bead, and 1 8/o bead. Slide them down to the end. 2. Pick up green 11/o seed beads in multiples of three until the strand reaches the desired length for your earring – at least 30 beads are needed for the fringe base, but you can go as long as you like. Add 1 red 6mm round, and 1 red 11/o. Skipping the red 11/o, stitch back up through the round bead and the following 9 green seed beads. Pull snug, making sure there is no slack in the strand. 3. Pick up 7 green seed beads. Skipping the last bead added, stitch back through the 6th bead and pull snug. 4. Pick up 4 green seed beads, and stitch back through the first bead added in the previous step, plus the following three beads in the main strand, moving towards the black round. Pull snug to form a leaf stitch. 5. Pick up green seed beads in multiples of three until you have a second ‘stem’ of the desired length. You can make it longer or shorter than the first cherry stem – whatever looks good to you. Add a red round and seed bead. Skipping the red seed bead, stitch back through all of the beads just added, and the following 3 beads in the main strand. Pull snug. 6. Pick up 7 green seed beads and add a second leaf stitch (steps 3 and 4). Stitch back up through the remaining beads in the main strand, and all of the black beads. Pull snug. 7. 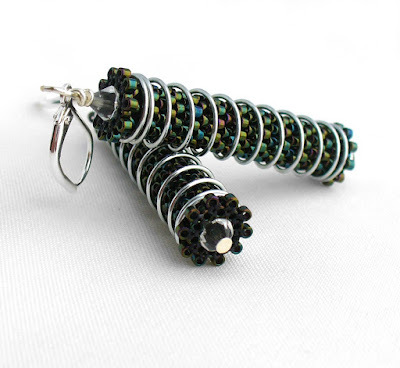 Pick up 9 black seed beads. Stitch back down through all of the black beads in the base to form a loop at the top of the beadwork. If desired, string on an ear wire or soldered jump ring before securing the loop. 8. Pick up green seed beads in multiples of three to begin a second cherry fringe. Repeat steps 2-6, making your fringes as long or as short as you like. Weave through the black seed bead loop at least once more to add strength, then secure any remaining thread in the fringe and trim. 9. Add jump rings and ear wires as desired, then repeat all of the steps to make a second earring. I’ve been in a complete creative funk all week, and the new collar project is mostly to blame. I started getting more than a little tired of working on it several days ago. Not only had it become rather boring, but I was running out of ‘good’ beads to use; searching through the mix to find seed beads of the right size was tedious. I’d been avoiding the project all together for a few days when it occurred to me that I don’t have to keep working on it. This piece was just an experiment after all. Now that I have all of the information I need about the stitch, I can stop any time. I think I might tinker with it a bit more and see if I can make use of it as-is, otherwise it’s going in the UfO pile. I have some quick tutorial projects lined up, and a commission for some matching rings. After that, who knows? So long as it’s not netted or blue, I’m down. 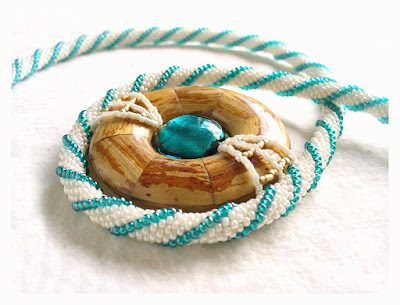 It’s truly wonderful what can happen when beads speak, and artists listen. Today my guest is Diana Coe of Beadwork & Coe. 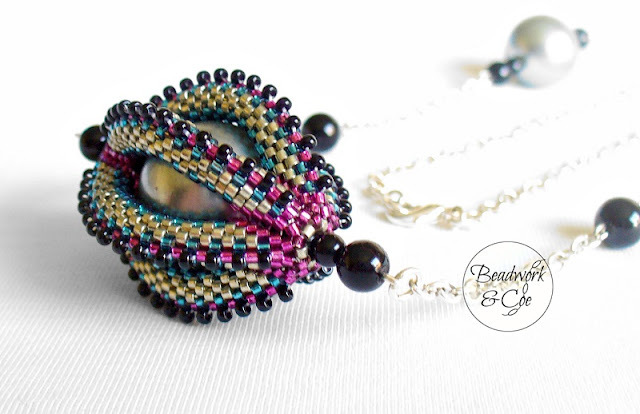 This UK-based artists creates a gorgeous variety of jewelry designs using beadwork and bead embroidery to showcase a wonderful palette of colors and pretty motifs. Diana: I started beading in 2007 after my son was born. Just staying home was new for me and I had always been creative in some shape or form. So I went into the local craft supply shop to see what's out there. Diana: It's not just jewellery, but in general beads. Jewellery started it as that's what beads are usually connected to, but increasingly I try to venture into other areas too. It's important for me though that my pieces are "practical". Diana: I've still got it. 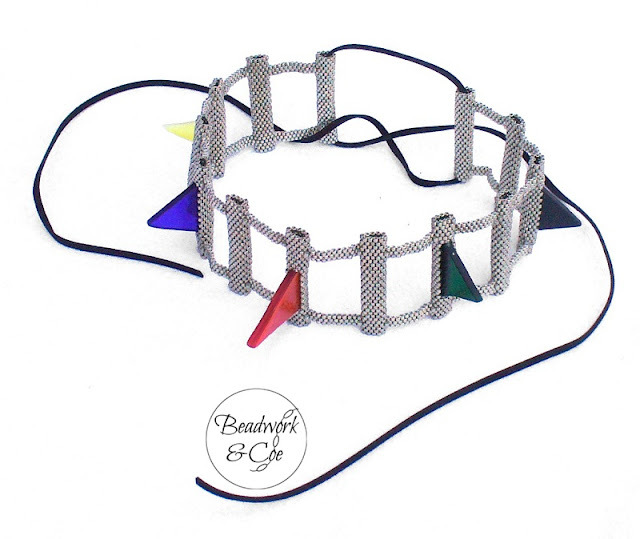 It is a necklace and bracelet set, made with brick stitch tubes in rainbow colours with matte golden metal beads strung in between. Inspirational Beading: Where do you look for your greatest inspiration? Diana: Honestly, I don't know. It just hits sometimes ... But one source of inspiration/direction for a new piece are definitely the monthly challenges of the Etsy Beadweavers, a group of bead artists with shops on Etsy were I am a member and leader. The themes for those challenges are always chosen by previous winners and can range from "Our Solar System" to "Game of Thrones" ­ it really makes the creativity work overtime. Diana: What can I say? The unusual ones I guess. I hate designs that use the same component over and over again, the repetition just drives me insane. In 2009 (I think) I started a bracelet made of Daisies, because it looked so cute. But after 4 or 5 I put it away and it's still not progressed any further. Diana: For my bigger pieces I usually start with a focal that "speaks" to me and then I go through my stash to find bits, bobs and beads that go with the overall feel I would like to achieve. Rarely do I make a drawing or anything, because I never stick to it anyway. Sometimes I lay out my larger components and take photos of different combinations as it's so easy these days, but that's it really. I just start stitching. Diana: All shades of metal, more silver than gold, are my first choice and then I quite like to add a splash of colour. In general I always go for interesting texture though. Diana: I love all the small beads, particularly Delicas. They just work so well for my style. Diana: You can't expect me to answer that and not be bias, please. I love all my babies! OK, let’s go with the winner of the Innovation Prize at an exhibition I was part of last year, it made me very proud. Diana: This will hopefully be the year when I conquer my fear of fish leather. It's so beautiful, but a bit intimidating ... I came up with a cuff design that uses it last year and I am still trying to get hold of some of my supplies. Diana: I always hope to show that beadwork is not all fringe and flowers. They seem to be the first things people think of when I say what I do and that is such a shame. There are a few designers that work in a more contemporary style, but there is room for improvement. Minimalists, technical minds and mathematicians to the beads. You can see more of Diana’s gorgeous designs in her Etsy shop, or on her website Beadwork & Coe.